[5 mins. 52 secs.] 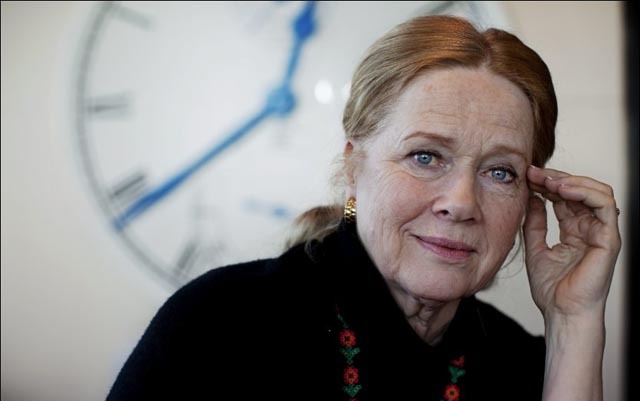 The first guest is the legendary actress & director Liv Ullmann ("Persona", "Scenes From a Marriage"). In her decades-long career, Ms. Ullmann has worked with many of the great actors and directors over the course of dozens of films. With "Miss Julie", Ullmann is in the director's seat. The film, which takes place over the course of a midsummer night in Fermanagh in 1890, concerns an unsettled daughter (Jessica Chastain) of an Anglo-Irish aristocracy who encourages her father's valet (Colin Farrell) to seduce her. [28 mins. 21 secs.] Then documentary filmmaking legend Chuck Workman ("Superstar") with his new film about Orson Welles, "Magician: The Astonishing Life and Work of Orson Welles". The film looks at the remarkable genius of Orson Welles on the eve of his centenary. The enigma of his career as a Hollywood star, a Hollywood director and a crucially important independent filmmaker is all explored in this wonderful documentary. Chuck is joined in this conversation by his son, filmmaker Jeremy Workman ("Magical Universe"). [58 mins. 10 secs.] Lastly, the Swedish filmmaker Göran Olsson ("Black Power Mix Tape") with his new doc, "Concerning Violence". The film narrates the events of African nationalist and independence movements in the 1960s and 1970s which challenged colonial and white minority rule. ← Ep 259: Robert Downey, Sr.